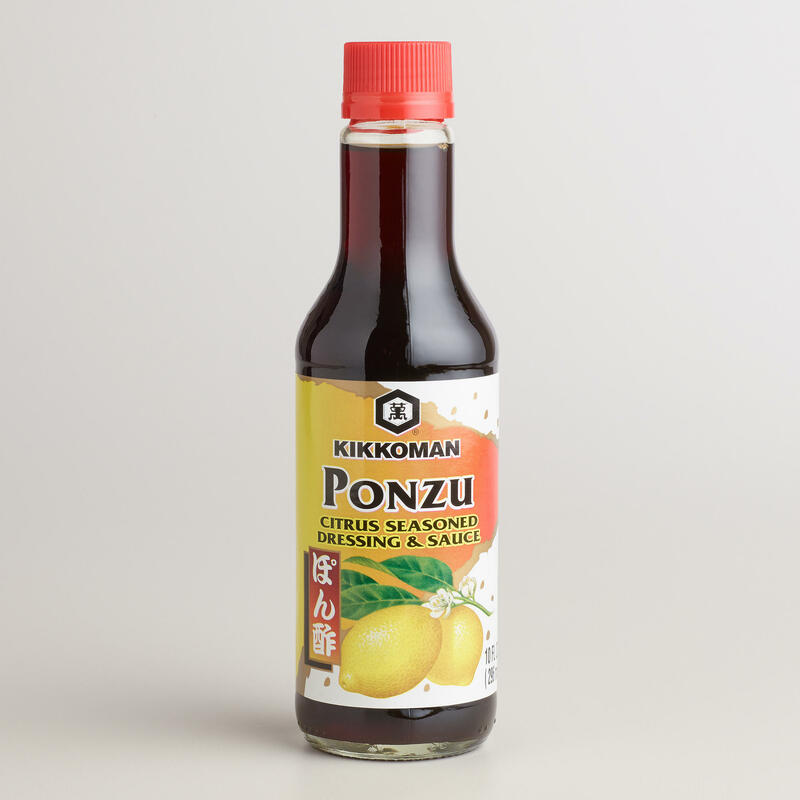 Ponzu is a citrus-based sauce commonly used in Japanese cuisine. It is tart, with a thin, watery consistency and a dark brown color. Ponzu shoyu or ponzu joyu is ponzu sauce with soy sauce (shoyu) added, and the mixed product is widely referred to as simply ponzu. The element pon arrived in the Japanese language from the Dutch word pons (which in turn is derived from and shares the meaning of the English word punch). Su is Japanese for vinegar, and hence the name literally means vinegar punch. Ponzu is made by simmering mirin, rice vinegar, katsuobushi flakes (from tuna), and seaweed (kombu) over medium heat. The liquid is then cooled, strained to remove the katsuobushi flakes, and finally the juice of one or more of the following citrus fruits is added: yuzu, sudachi, daidai, kabosu, or lemon. Commercial ponzu is generally sold in glass bottles, which may have some sediment. Ponzu shoyu is traditionally used as a dressing for tataki (lightly grilled, then chopped meat or fish), and also as a dip for nabemono (one pot dishes) such as shabu-shabu. It is used as a dip for sashimi. In the Kansai region, it is offered as a topping for takoyaki. Recipe for Ponzu see Here and Here.